Last night’s flight aboard SOFIA had us peering into the chemistry of a range of planetary nebulae and large molecular clouds. We first looked at N159 in the Large Magellanic Cloud (LMC), a neighbouring galaxy 170,000 light years away, moving away from us. N159 is a star forming region, a large cloud (over 150 light-years across) of gas where hot newborn massive stars are being born. Next we repositioned the telescope to peek at the Tarantula Nebula, also known as 30 Doradus, a very active star formation region in the LMC. Supernova 1987A, which SOFIA will observe later this summer with an infrared camera, occurred in the outskirts of this Tarantula Nebula. With SOFIA’s GREAT spectrometer, scientists were studying atomic oxygen in both star forming regions with the hope to better understand the physical properties of this unique regions in the LMC. SOFIA’s focal plane imager (visible guide camera) with a 8’x8′ field of view centered on 30Doradus. Our eyes turned towards the Butterfly Nebula, a planetary nebula in the constellation Scorpius. Unlike young-stellar objects and star-core clumps where we are trying to assess the chemistry of star formation, here we are studying planetary nebulae , part of stellar death. The Butterfly Nebula has a double-lobed structure: an area of active study of the kinematics (speed, interactions, shocks) of the gas and its makeup (ionized, atomic, molecular). On this flight, SOFIA did some mapping of this object in multiple atomic transitions. Later we looked at the Red Spider Nebula in the constellation Sagittarius, another bi-polar (two lobed) planetary nebula like the Butterfly, but with immense wind speeds. For both planetary nebula, scientists are measuring two transition of neutral oxygen to assess what’s putting in the energy to make these beautiful structures. To first order the UV radiation from the central white dwarf should be enough, but the intensity and variety of atomic and ionized species implies there must be another source of energy. Hopefully these SOFIA observations can shed light on that mystery. Eta Carinae is one of the most fascinating objects in the sky, a stellar system made up at least 2 stars (maybe more) which is has been undergoing dramatic changes, with documented brightness changes hundreds of years before. Being south of 60 degree South Latitude it is not at all viewable from the northern hemisphere and its bright enough to be a naked-eye object. One star in this system is hypothesized by many astronomers to explode as a supernovae in the near future. It is losing mass at an incredible rate. SOFIA will take inventory of ionized carbon in this object to confirm the presence of a cloud of material across it. 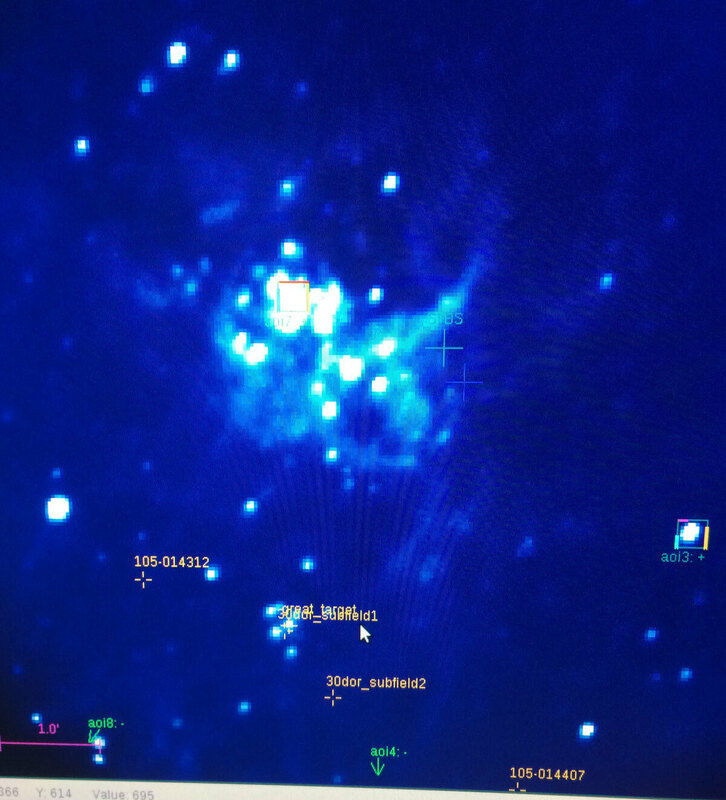 Last night, other areas of study for our flying astrochemistry observatory were to understand the role of hydrides (binary compound with hydrogen) in a massive star formation region plus mapping of the ionized gas near our galaxy’s central massive black hole. It was a jammed-pack flight with a whole load of cool targets! 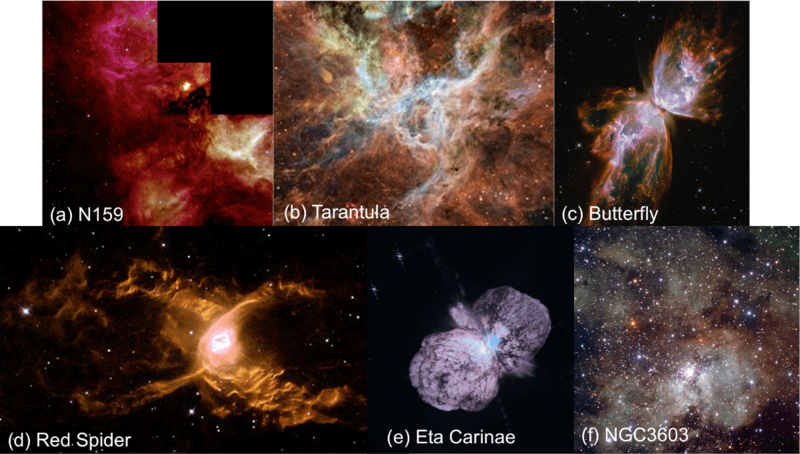 Some of the exotic targets for SOFIA’s July 5th Flight (a) N159, (b) 30 Dor (Tarantula), (c) NGC6302 (Butterfly), (d) NGC6537 (Red Spider), (e) eta Carinae, (f) NGC3603 (stellar nursery). We were doing spectroscopy of these sources to better understand their dynamics. It gets cold on these flights with the GREAT instrument, as they like to keep their electronics cool. I was armed with my flask of hot tea, many layers of fleece, thick socks, and hat, gloves and scarf. It did help that you could walk around a bit to stretch those legs, talk with different members of the crew, and think about the uniqueness of this amazing observatory flying high above planet Earth, coming home in the morning. Just in time for breakfast, and tea. Kimberly all in her fleece, with Stefanie Milam (behind). 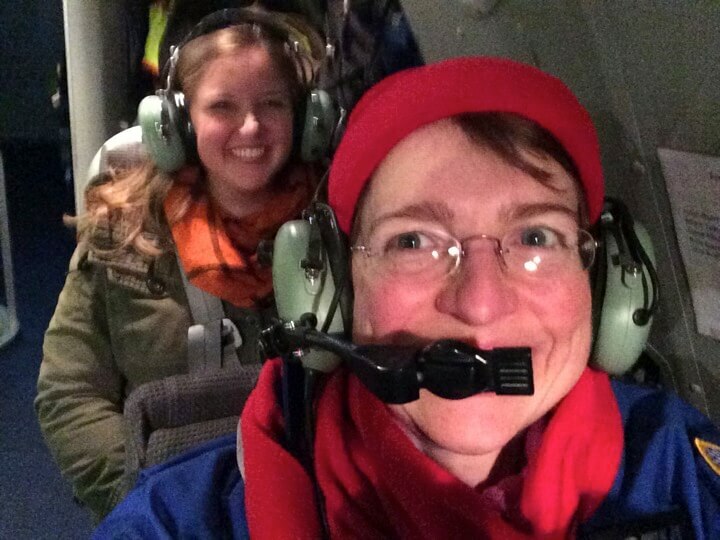 Ready for landing after a science-filled flight.